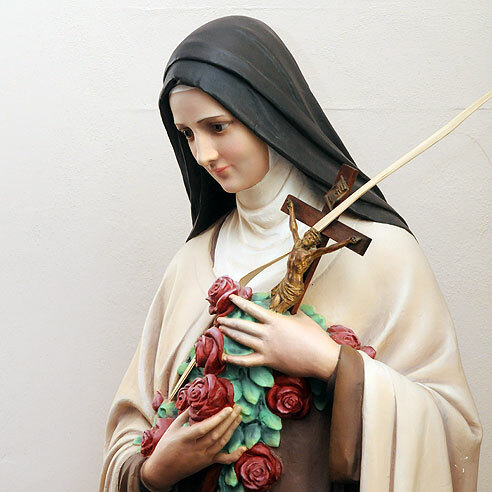 St. Teresa of the Infant Jesus (Therese of Lisieux), born in 1873, was a Carmelite nun who died at the young age of 24. Canonized in 1925, Teresa is one of the patron saints of the missions, not because she ever went anywhere, but because of her special love of the missions, and the prayers and letters she gave in support of missionaries. This is reminder to all of us who feel we can do nothing, that it is the little things that keep God's kingdom growing. In 1997, Pope John Paul II declared St. Teresa a Doctor of the Church - the only Doctor of his pontificate - in tribute to the powerful way her spirituality has influenced people all over the world.